Flexing their muscles, Boulder City High School’s boys basketball team routed Somerset Academy Sky Pointe 69-42 on Jan. 17. 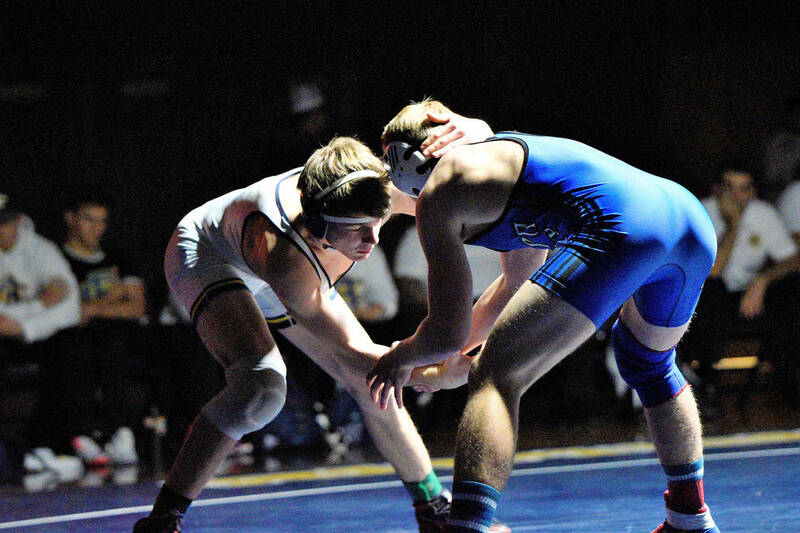 (Robert Vendettoli/Boulder City Review) Boulder City High School junior Ladd Cox battles for positioning against his Moapa Valley opponent on Jan. 16, 2019. Cox picked up the victory via decision. The Eagles jumped out to a 42-18 lead at halftime. In all, 11 players scored for the Eagles, highlighted by three in double figures. Leading the way offensively, senior Derrick Thomas scored a game-high 18 points, while Bailey and sophomore Matt Morton each scored 13 points. The Eagles will travel to Sunrise Mountain on Friday, Jan. 25, before hosting Eldorado on Monday, Jan. 28, and rival Moapa Valley on Tuesday, Jan. 29. Boulder City High School’s wrestling team split a pair of league matches recently, defeating rival Moapa Valley on Jan. 16, while falling to rival Virgin Valley on Tuesday, Jan. 22. Defeating the Pirates 70-6, seniors Mike Kaposta (285 pounds), Jimmy Dunagan (195 pounds) and Thorsten Balmer (182 pounds) and junior Cade Cowley (170 pounds) all won by pin fall. Outclassing their opponents, senior Hayden Moore (160 pounds) and juniors Ladd Cox (152 pounds) and Jason Krumm (120 pounds) won by decision. Suffering their first defeat against the Bulldogs 42-39, senior Ryan Vanario (220 pounds) picked up a pin fall, along with Dunagan and Moore. Balmer picked up a 12-6 decision in his victory. Moving toward the postseason, results from Wednesday’s senior night against Chaparral will appear in next week’s issue.